1st Baron Dorchester, was a native of Co. Tyrone in present-day Northern Ireland who served in the British military with distinction and eventually became the Governor of the Province of Quebec. He gained the grudging respect of the French population of Quebec by implementing the Quebec Act of 1774, upholding their religious freedom and traditional customs. Called the “man of a thousand eyes”, he was in charge of repulsing the American assault on the city in 1775. When Montreal fell to the rebels, Carleton barely had time to sneak out of the city dressed in civilian attire. In the midst of the subsequent siege, a woman from the American camp was secretly sent into town with letters addressed to the merchants of the city, promising them many benefits if Quebec was immediately surrendered. She also had a letter for Carleton, demanding the immediate submission of the city. Needless to say, he didn’t leap at the opportunity, since he was in a secure, well-fortified position. Instead, she was locked up in jail for several days, and then unceremoniously thrown out of town. He then ordered all those residing in Quebec who were liable to do military duty should take part in the defense. If they refused, they and their families had four days to get out of town, or otherwise suffer the penalty as traitors to the state. Major Preston, the British commander of the garrison at St. John’s, had no choice but to surrender the fort to the Americans. The rebels, so often derided by the British as "savages" who had no respect for authority, treated him with all the honor and decorum appropriate for a man station. Meanwhile, the American Major Meig, next in command after Benedict Arnold at Quebec, made British Captain Law his prisoner in the morning; however a few hours later, after the fortunes of war turned in favor of the British, Law made Meig his prisoner. They both dined together with great courtesy and lived up to the ideals of noblesse oblige. “O though swift winged messenger of destruction, how didst thou triumph in that moment! The stroke that severed Montgomery from his army deprived them of more than a member. It reached the vitals, and struck the whole body with a temporary death. As when the forked lightening, darting through the forest, amidst the black tempests of night, rends some towering oak, and lays its honors in the dust, the inferior trees which it had long sheltered from the storm stand mournful around. So stood the astonished bands, over their fallen chief! Nor over him alone, but over others, in their prime of glory, prostrate by his side. 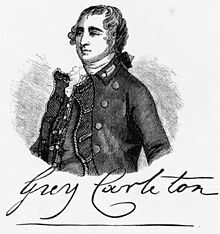 While General Carleton's later cautiousness would be derided by some of his fellow officers and London politicians, he was one of the few British officers to make it through the war with the Colonies with his reputation basically unscathed. Furthermore, beneath a somewhat gruff and dour-faced exterior, he had a strong attachment to justice and a deep sense duty to his people. He even refused to return African slaves liberated by the British during the war and refused to break his word to them, in spite of the complaints of American officials.